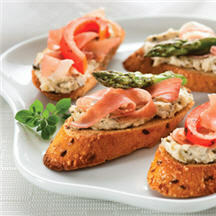 Add a touch of Tuscany to your meal with this simple, yet elegant crostini appetizer made with thin slices of multi-grain baguette topped with prosciutto, creamy goat cheese and a delicious pesto spread. Buon appetito! Preheat broiler. Cut bread into 40 (1/2-inch-thick) diagonal slices. Place on baking sheet. Broil for 1 to 2 minutes on each side or until golden. Rub tops of bread slices with cut garlic halves. Discard garlic. Combine cheese and pesto in small bowl; stir until combined. Spread about 2 teaspoons mixture over each toasted bread slice. Top evenly with prosciutto and any additional toppings.